Okay. I've had enough. Scotland were thoroughly cuffed in Kazakhstan and the knives are out for manager Alex McLeish. Is there any way back in the race for Euro 2020? San Marino are up next on Sunday. Surely that will be a safe three points? Surely? If not, we have a handy 'Is that the worst 90 minutes ever for Scotland?' article we can quickly edit. Sportscene is on the BBC Scotland channel at 23:00 if you want to relive the defeat in all of its gory detail. Quote Message: Alex McLeish is changing things from the ageing squad Gordon Strachan had and introducing younger players. Look at the average age of the squad - 24, 25 - and lack of caps in the team. Scott Bain, Scott McKenna and David Bates is the inexperienced nucleus of the side tonight. That's not an excuse, it's fact. Alex McLeish is changing things from the ageing squad Gordon Strachan had and introducing younger players. Look at the average age of the squad - 24, 25 - and lack of caps in the team. Scott Bain, Scott McKenna and David Bates is the inexperienced nucleus of the side tonight. That's not an excuse, it's fact. Quote Message: I’m worried that Scotland will limp on. Where’s the anger? Where’s the passion? The country’s going ballistic and where’s that reflected in the manager's attitude? I just think: 'come on show some emotion'. I’m worried that Scotland will limp on. Where’s the anger? Where’s the passion? The country’s going ballistic and where’s that reflected in the manager's attitude? I just think: 'come on show some emotion'. Scotland are now second bottom of Group I after Cyprus thrashed San Marino 5-0. Alex McLeish must now rally his troops for Sunday's visit to the microstate within Italy. It would seem more of you agree with Tom English than Willie Miller with the hashtag #ecksit catching fire on Twitter, but is social media an accurate gauge of public opinion? Quote Message: I don't see a mountain of evidence that Alex McLeish is not capable of taking us forward - it's more of a molehill. He deserves the opportunity to qualify next March by beating Finland and another team of that ilk in the Nations League play-off. He got us there. It's not fair to call for the manager's head after one game. I don't see a mountain of evidence that Alex McLeish is not capable of taking us forward - it's more of a molehill. He deserves the opportunity to qualify next March by beating Finland and another team of that ilk in the Nations League play-off. He got us there. It's not fair to call for the manager's head after one game. Quote Message: It’s a question of whether you have faith in Alex McLeish getting the job done. Even though sacking him after one match in a qualifying campaign might seem brutal, I think it has to be done. This isn’t a game for lightweights. This a serious business and Scotland haven't qualified for a major championship for ever. There comes a time when a performance is so bad, so inept, that the normal rules of giving a manager time doesn’t apply. It’s a question of whether you have faith in Alex McLeish getting the job done. Even though sacking him after one match in a qualifying campaign might seem brutal, I think it has to be done. This isn’t a game for lightweights. This a serious business and Scotland haven't qualified for a major championship for ever. There comes a time when a performance is so bad, so inept, that the normal rules of giving a manager time doesn’t apply. Kazakhstan's comfortable win proved a dream start for head coach Michal Bilek in his first competitive game in charge. The Czech said: "We are a bit surprised at the result but at the same time we can say we controlled the game from the start and we deserved to win. It's not every day you beat such a strong team so we are very happy." Quote Message: It's not just on the pitch, it's off the pitch. When Alex McLeish says Scotland started brightly, that troubles me. When he said take inspiration from the rugby team - that troubles me. Is that all he's got? What about tactical changes? It's not just on the pitch, it's off the pitch. When Alex McLeish says Scotland started brightly, that troubles me. When he said take inspiration from the rugby team - that troubles me. Is that all he's got? What about tactical changes? Quote Message: Right away, I was drawn to Alex’s choices in the midfield area. You need structure, a lynchpin, someone who’s going to conduct play and I felt that in that midfield three there was no natural anchor. All three players are similar, good at breaking forward. I feel McTominay could have played or Shinnie could have been that man. Right away, I was drawn to Alex’s choices in the midfield area. You need structure, a lynchpin, someone who’s going to conduct play and I felt that in that midfield three there was no natural anchor. All three players are similar, good at breaking forward. I feel McTominay could have played or Shinnie could have been that man. 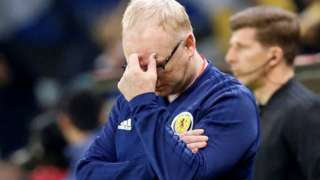 Manager Alex McLeish refuses to discuss his future after leading Scotland to one of the nation's most ignominious defeats in their opening Euro 2020 qualifier in Kazakhstan. Celtic goalkeeper Scott Bain says Scotland have the rest of the Euro 2020 qualifying campaign to put things right. "Disappointing; we need to be better," he says after his second international appearance. "It’s gone now. We need to learn from it quickly and move on to the next one. "We need to better organised, putting pressure on the ball and matching their runners. You can’t let runners go at this level. "A lot of people were surprised that Kazakhstan punished us. Players that play at international level can punish you in all sorts of ways. Every goal has really killed us. "We spoke to the Celtic lads that played Astana, so it didn’t take us by surprise. We just let ourselves down at the start. "It‘s always difficult when you’re away in Europe. We’re lucky it’s happened in the first game and we have the whole campaign to make that right." Kazakhstan's Yan Vorogovskiy (R) beats Scott Bain (L) to make it 2-0 to the hosts.Image caption: Kazakhstan's Yan Vorogovskiy (R) beats Scott Bain (L) to make it 2-0 to the hosts. Quote Message: I don't think Alex McLeish can look for excuses. The manager's job is to get the players he picks to perform and they didn't perform. Ultimately the responsibility lies with him. I don't think Alex McLeish can look for excuses. The manager's job is to get the players he picks to perform and they didn't perform. Ultimately the responsibility lies with him. I guess the logic is Scotland want Belgium to sweep all the other sides aside and leave us scrapping for second place but that seems borderline ridiculous after today's result. Scotland manager Alex McLeish has been dealing with some blunt questions about his future. “I’ll just continue to do my job and won’t get drawn into that," he replies at his media conference. “I want to get these lads playing to the level we demand on the international scene, but it’s not easy for players with no experience to come straight in. “We played a bit slow at times. We had emphasised the need to play fast, take as few touches as possible, and we ran with the ball too much and didn’t pass it swiftly enough. “I don’t really rank defeats. I always feel low after a defeat, but I’m pretty good at bouncing back." David McDonald: "Why hasn’t he been sacked yet? In a long list of Scotland humiliations this is right at the top." George R: "So glad internationals don't particularly interest me I like seeing Scotland win but I was free to watch that nonsense and laugh. The SFA are to blame McLeish was a terrible appointment." Mightywell1886: "I'm finished. It's over for me."